Wow. My first guest post. A few things to know before we start: the banya is a Russian bathhouse. Since childhood, I’ve always enjoyed being in water. I was (and sometimes continue to consider myself) a competitive swimmer. I’m also known to compete in the “executive triathalon” (i.e., sauna, hot tub, and steam room) without even exercising first. So while I’m not an expert, I’ve enjoyed my share of water- and bath-related activities. My friend Nick, also an American, agreed to join me for our trip to a banya in Moscow. We chose to visit Sanduny Baths, because of how the Lonely Planet Moscow guide talked it up. The Sanduny Baths have separate facilities for men and women, and for the men, there are three classes of baths: “First Class Man,” “Higher Class Man,” and “Highest Class Man.” Nick and I decided we’re clearly of the highest class and willing to spend 500 rubles (~$20), so off we went to be Highest Class Men. Just a quick(ish) wrap-up on the places we ate in Moscow and St. Petersburg a few weeks ago. Cafe Pushkin and Molokhovets Dream got their own posts because they’re expensive, “destination dining” types of places that get written up everywhere. And this post is where I’ll quickly summarize some of the other restos to give you a sense for the dining scene. Keep in mind that I don’t speak Russian and I’m no local, but in my favor, I’m a very curious, interested outsider. 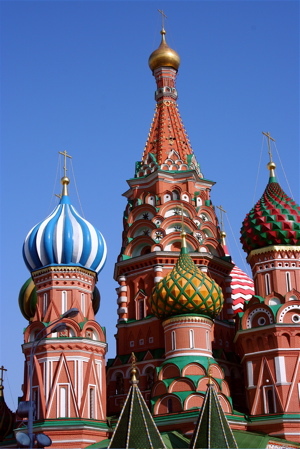 (Well, and also while in Moscow, I traveled with a friend who lived in Moscow into her teens). Bocconcino was my favorite dining-out experience in Moscow. I know – eating Italian food in Moscow sounds silly, but it’s not like Russians only want to eat Russian food when they go out. The decor is chic and warm, and the beauty of our showing up underdressed in jeans is that we got seated in a smoke-free, quiet back room instead of the more “scenester” front room. I’d read in the Moscow Times that the restaurant had a wood-burning oven and delicious pizzas, and like I said a few posts ago, after several days of eating only Russian food, I couldn’t resist the siren call of buffalo mozzarella and Mediterranean flavors. Most pizzas and pastas are 400-600 Rubles ($16-$24), so it’s not priced like your neighborhood pizzeria, but the ingredients are quality and the food is hot and fresh. Service was slow and disinterested. 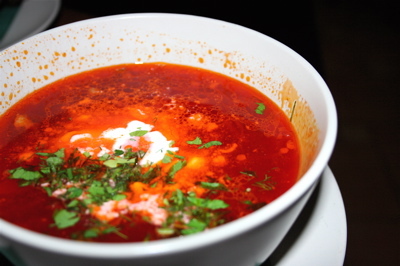 Kvartira 44 was recommended by Helen’s Moscow friend, Masha, and I think if I could travel back in time, Kvartira would have been an introduction to Russian food as good as the one we had at Cafe Pushkin. The big advantage of Kvartira would be that it’s about five times cheaper than Cafe Pushkin. 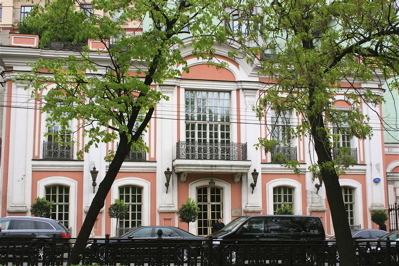 The decor of Kvartira is that of a small home library and that of Cafe Pushkin is that of a large, grand home library. So think of Kvartira 44 as Cafe Pushkin Lite. Borscht, pelmeni, blini, smoked herring – it’s all here and for the most part, it all tasted no worse than the versions we had at Pushkin. The teas offered were varied, and getting hot water refills was easy. I highly recommend trying this place out to try classic Russian dishes in a casual, comfortable room. It’s a little bit tricky to find because the doorway is inside an archway, but it’s down Tveskaya Boulevard from Cafe Pushkin, so it’s in a nice neighborhood (i.e., don’t be dodged out by the archway entrance). The total for four appetizers, three mains and three pots of tea: 2000 roubles ($80). Sword and Shield could have been *a lot* worse. I think the boys pushed us into going here. It’s a restaurant that’s close to Lubyanka, the former headquarters of the KGB, so the place was (and perhaps still is?) popular for cloak and dagger types. Sword and Shield has the drab brown colors you’d expect in a KGB office circa 1970, and all the potraits of KGB stars (including one of Putin in his black belt outfit) demand reverence. Videos of Putin in the news cycle through the TV in the corner, and that’s it by way of background noise. Don’t come here expecting kitsch that you can laugh at. We stopped by for lunch because it’s not a far walk from Red Square, and we actually enjoyed our food. Nothing fancy. Your usual Russian dishes. The blini were especially good there, I thought. 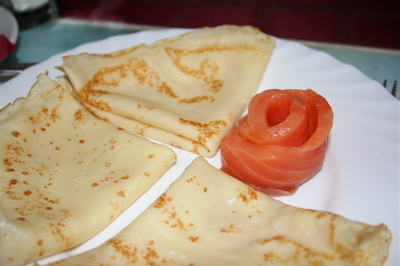 Big, fresh, eggy crepes and generous portions of smoked salmon and salmon caviar. 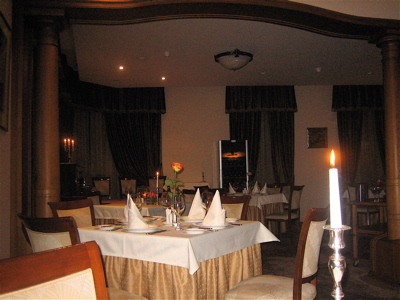 Similar prices to those of Kvartira 44, with our tab for four appetizers, four mains and drinks totaling 500 ($20) roubles per person. Don’t miss the camouflage leaves in the bathrooms. No joke. As for Dioskuriya and Fisheria – avoid at all costs. The former is a Georgian restaurant recommended in several sources (including our Lonely Planet Moscow guidebook – which I used only because it was the most up-to-date one I could find on Moscow), and when we showed up for lunch, it was empty except for a table of tourists and two tables of large men smoking, drinking and talking into their phones constantly. Our server took so long to serve us our food that after an hour of waiting around for just the hot tea to arrive, we just canceled our order and left. The latter, Fisheria, was the site of the Fish with Congealed Cheese Incident. The crab soup wasn’t bad, though you have to pretend like the chicken broth doesn’t include huge pools of chicken fat oil on top. In St. Petersburg, in addition to splashing out at Molokhovet’s Dream, we also ate at the Georgian-Azerbaijani restaurant, Karavan, and the Russian restaurant, Cafe Idiot, both recommended by the normally-excellent Wallpaper Guide series. Karavan was pretty good. If I had to give a quick description of the food, I’d say think grilled meats and middle-eastern style rice and breads. The plov (rice dish with grilled lamb and dried fruits) was especially good after you added some salt, and the service was helpful and friendly. The breads tasted stale and store-bought, though. As seemed typical in many restaurants we’d tried in Moscow, the decor was pretty cheesy: at the back of Karavan is a large, paper mache camel living it up in what looks to be an oasis. Entertaining. Two appetizers, breads, beers and mains cost 1000 roubles ($80). Cafe Idiot, named after the Dostoevsky novel, I would avoid. The only reason I can think of for why it made it into the higly-edited, style-conscious Wallpaper St. Petersburg guide is because the staff speak english and the decor is quirky and cozy (i.e., lots of antique typewriters, shelves of books – again with the books in restos! 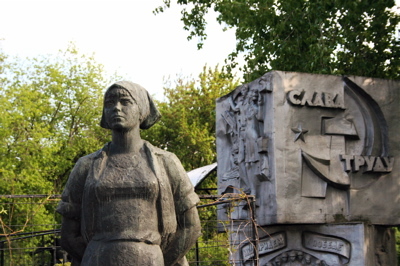 – busts of Lenin). But all the food we tried (and we tried a lot) was terrible. The fried brown bread tasted like stale oil; the pickles were soggy; the salmon blini were pre-filled with mostly sour cream and dill (where’s the salmon!?! ); and the potato pelmeni took blandness to new heights, despite the “mushroom sauce” and bushels of dill. I did like my pot of berry tea, though, so if you go, perhaps go just for tea and dessert. Our tab for two was just shy of 1000 roubles ($80). Not learning our lesson at Cafe Pushkin about the questionable quality-to-price ratio of high-end Russian restaurants, Jon and I ate at Molokhovets Dream in St. Petersburg, too. We liked the description of the restaurant in this 2007 New York Times travel article. According to the NYT blurb, the place has six tables, good food, and a good backstory. (Elena Molokhovets was the Julia Child of 18th-century Russia, writing a cookbook (“Gift to Young Housewives”) that was the cookbook for bourgeois women in pre-revolutionary Russia. And this restaurant pays homage to her recipes). So on a Saturday night in St. Petersburg, we hailed a cab (a real cab – the Moscow practice of just hailing a private car just isn’t done in St. P) and popped on down to Molokhovets Dream, which is not far from Moskovski train station. Many of the high-end Moscow restaurants that get current hype in English-language sources sounded unappealing to me, largely because they follow the trend right now in Moscow for “themed” restaurants. Shinok, for example, has live farm animals to enhance its peasant house theme, and Turandot seems to get press that focuses only on the $50 million price tag for its decor. The Economist City Guide for Moscow called Cafe Pushkin a “favorite,” and according to the New York Times/Fodor’s blurb, Cafe Pushkin is “perhaps Moscow’s most sophisticated restaurant.” Good start. And when one of Helen’s Moscow friends strongly recommended Cafe Pushkin for good Russian food in a “pre-revolution” mansion setting, I was sold. (That the restaurant turned out to be walking distance from our apartment near Tverskaya was icing on the cake). Meeting my friend Helen’s friends from Moscow. Everyone was so warm and chatty that we felt right at home, and confronted by everyone’s perfect English, I felt once again humbled for not being able to reciprocate in a local language. (Special thanks to Masha’s husband, Lyonya, who took an afternoon off work to show us around the cathedrals in the Kremlin). The Moscow metro. The stations are works of art; the trains seem to run every 60 seconds; and it’s dirt cheap (10 trips for 155 roubles/$6). The buffalo mozzarella pizza at Bocconcino restaurant, near Pushkinskaya metro. Creamy, rich mozzarella that tastes like Italy. Exactly what I needed after five days of eating smoked, salted and/or pickled foods of all shapes and sizes. Drinks at the Bosco Bar at GUM. You get a perfect view of Red Square (so here’s where I squeeze in how much I loved the sight of Red Square for the first time); the servers are helpful; the gin fizz is perfect; and most drinks are 320 roubles/$13, which is a steal considering the previously-mentioned. The “Red Arrow” overnight train from Moscow to St. Petersburg. It’s plush, old-school train travel, complete with red velvet curtains and comfy, clean beds. Well worth the 6400 roubles/$270 we paid for two one-way tickets. Jon and I shared a four-person kupe with two young businessmen who work in central Russia and “commute” home to St. Petersburg by flying to Moscow and then taking the overnight train to St. P. When I commented that this sort of travelling must be “hard,” one of the men replied (without pause, bitterness or irony): “life is hard.” And now I understand how Russia gave the world Tolstoy and Dostoevsky. Bad value-for-money at many (though not all) restaurants we tried. In Moscow, we ate at Café Pushkin, Kvartira 44, Sword and Shield, Dioskuriya, Fisheria, and Bocconcino. In St. Petersburg, it was Molokhovet’s Dream, Karavan, and Cafe Idiot. I’ll write in more detail about a few of these restos in my next couple of posts this week. Long lines. Maybe it was because Russia had a holiday weekend recently (for Victory Day), but I swear I’ve never waited on so many lines in my life. More on this when I post about our trip to Peterhof (if you’re unfamiliar with Peterhof, think Versailles, but bigger and with more gold – yikes). The nickel-and-diming at several major tourist attractions. More on this in a future Peterhof post. Overall, a great trip, but more challenging than Jon and I have gotten used to when traipsing around Europe. Despite learning how to read the cyrillic alphabet (a must if you travel sans organized tour in Russia), I still took ages to figure out signs, and getting anything done always took three times longer than expected. Jon and I arrived in Moscow this evening to start our nine-day holiday in Russia. The weather is mild and sunny, and we’ve settled smoothly into our rented apartment near Tverskaya metro station (aka Pushkinskaya or Chekhovskaya). As you’d expect, every sign and map here uses the cyrillic alphabet, so lucky for us that we’ve come with a friend who’s originally from Moscow. (I’m sure Helen felt equally lucky having to translate the entire restaurant menu for us at dinner this evening). I was going to say our departure this morning from Heathrow Terminal 5 was very snazzy (the terminal is a gleaming beauty, with outrageously nice duty-free shops and sleek, spacious bathrooms), but Helen and her husband, Nick, arrived at Moscow Domodedovo missing one piece of luggage. So now we suspect their bag was sucked into the vortex of their Terminal 5 transfer from a US-UK flight to their UK-Russia one. Here’s hoping the luggage finds its way to our door tomorrow. The apartment we’ve rented is small, but clean and close to a few pretty restaurants and cafes (as well as to the South African Embassy), so I think it will make a nice base for the next few days before we go to St. Petersburg. This evening, we ate nearby at a local restaurant called the Fisheria, which looked like a NJ diner, complete with harsh lighting and linoleum floors. 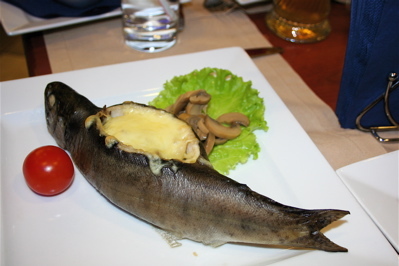 The food was very very eh (the whole fish stuffed with congealed cheese will haunt me forever – see photo below), but the meal cost 1200 Rubles ($50 at 24 Rubles to the Dollar) per couple, so at least it wasn’t expensive. It was, however, very poor value. We were much more excited about the grocery store next door to the restaurant, which offered an enormous variety of foods for sale – everything from rice noodles to four different types of risotto rice. Faced with this sort of choice and abundance, I laughed when I thought about how we used to call our neighborhood Safeway in DC the “Soviet Safeway” because its shelves were always empty and its queues were endless. I’m excited to start exploring Moscow in earnest tomorrow, so here’s hoping the good weather sticks around.